9. Halfords Bug & Tar Remover | What Car? Like the two Turtlewax products on test, the Halfords remover is more like a polish. Halfords fluid is the cheaper of the three and worked well once it had been left to act for a minute. Cheaper than both Turtlewax removers. Residue needs to be washed off, which makes the process more involved fine if you were planning to wash your car anyway, but not for a quick clean up. 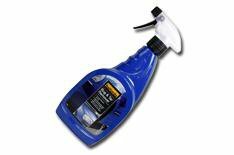 Can be used to remove a wide range of contaminants from glass and painted surfaces, but not rough, unpainted plastics.